The Pittsburgh Steelers (5-2) take on the Detroit Lions (3-3) at Ford Field in week 8 of the NFL. 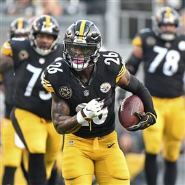 Le’Veon Bell is back to his normal self after a slow start this season as he’s averaging 97.7 yards and 24.1 carries per game (which ranks him first in the league). This week he faces a difficult test as Detroit is one of the toughest teams to run on as they are just giving up 3.7 yards per carry (tied for seventh in the league) so it would not be surprising if the Steelers decide to give him the ball a little less in this matchup. If that happens he will still be the key to victory as the Steelers won’t completely look away from him. Expect Pittsburgh quarterback Ben Roethlisberger to instead target him on a few passing plays passes to utilize the dynamic back as an escape valve to evade the Lions pass rush. The Lions continue to struggle running the football as they are picking up just 3.5 rushing yards per carry, which ranks them 27th in the league. Fortunately for Detroit, the Steelers are one of the easiest teams to run on. Their rushing defense has had its share of problems as they are allowing 4.7 yards per attempt this season, which has them tied for 26th in the league. Pittsburgh has two losses on the year and in both of those they allowed more than 200 rushing yards. In contrast, in their five wins, they held opponents to under 100 yards on the ground. The key issue for the Lions to figure out is what Steelers defense they will be facing this week and how they will attack it. The Lions could try to take a gamble and adapt their rushing plan and go after the Steelers on the ground or they could try the conservative approach and let Matthew Stafford’s use his arm to carry them to victory. If they want to use the conservative strategy the Lions offensive line will have to do a better job of protecting him. Stafford has been sacked 23 times in six games (only the Indianapolis Colts have a worse average during that span). That won’t do it against the Steelers, who are tied for second place in the league with 24 sacks in seven games. Their secondary has fed off that as no other team gives fewer passing yards per game than Pittsburgh. Any of the two approaches will be incredibly tough matchups for the Lions and as a result, it’s difficult to foresee Detroit winning this one even though they are at home. Expect this to be a close one though as Roethlisberger has Struggled when he’s away from Heinz Field. The Steelers will probably use a heavy dose of Bell to open up the passing game and then let “Big Ben” and wide receiver Antonio Brown do the rest to outscore the Lions.